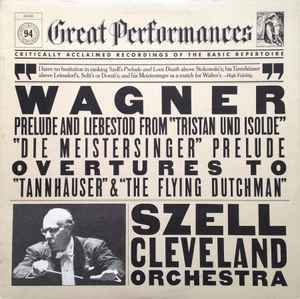 Wagner* / Szell*, Cleveland Orchestra* ‎– Prelude And Liebestod From "Tristan Und Isolde", "Die Meistersinger" Prelude, Overtures To "Tannhäuser" & "The Flying Dutchman"
Previously released on MS 6971, MS 6884, D2M 32317, BC 1245. From the sleeve: "Re-mixed and re-mastered from original tapes, using the Dolby System..."
Original inner sleeve is two-sided advertisement / proof-of-purchase for the CBS Great Performances series, with pictures of the first twenty-five releases on one side (although the pictures do not accurately reproduce the sleeves), and a list of the remaining seventy-five on the other (see photos). ©1983 CBS Inc.
Hand-scribing of the runout on this issue in the series is more typical of later issues (the great majority of 1981 and 1982 releases were stamped).